TUNA PRIZE is pleased to present its first exhibition <Tuna Migration: review exhibition of Tuna Prize winners>, a group exhibition of Tuna Prize winners Wong Ka Wing (2009), Reds Cheung (2009), Susie Law (2009), Roger Ng (2010), Chan Kit (2010), Victor Wong (2011) and Sit Chun Ning (2011). TUNA PRIZE is an art award celebrating the well-performed graduating students of Academy of Visual Arts. It was set up in 2009 by the first year alumni, and it is judged by alumni from different year and awarded in the graduation show each year. The latest trend of local art can be seen through the young artists’ jury panel. Therefore, Tuna Prize is a special significant for every fresh graduate. We hope that it can keep going on by graduates of coming years and years. 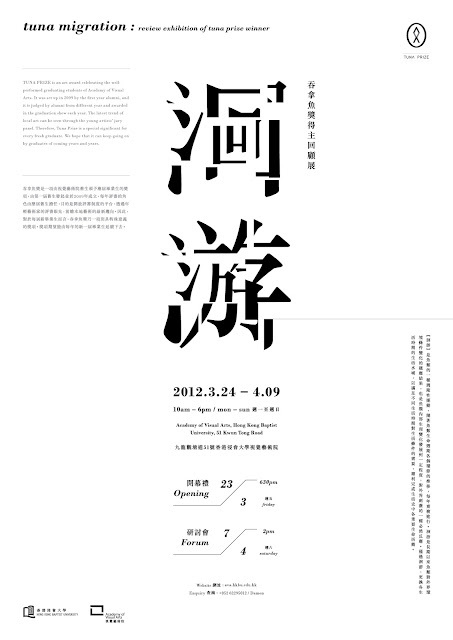 The exhibition is composed of two parts. The first part reviews the development of Tuna Prize since its formation in 2009, including its background, award winning works, judging records, etc. Another part shows the recent works of the prizewinners after their graduation. By providing a platform for Tuna Prize Winners to show their art creation, we would like to prove Tuna Prize’s ambition in encouraging young artists to continue their art creation.